Kidney failure can be acute with sudden onset, or chronic with slower development. Chronic Renal Failure (CRF) is also known as kidney disease and is sadly a progressive, irreversible condition. The problem is relatively common in both cats and dogs but affects a much higher proportion of cats. While cases of kidney failure in younger animals are found, it is typically a problem for mature and senior animals and is difficult to detect in the early stages. To begin with, the kidneys deteriorate unnoticed and when they are no longer able to perform their roles sufficiently, signs of illness become apparent. By this time, the majority of the functional units have been damaged beyond the point where remaining healthy units can compensate. Once diagnosed, management of the condition is key to an animal's health and happiness and they can go on to live many more months or even years. There are a few well recognised causes of renal failure including bacterial infection, kidney tumours, polycystic kidney disease and damage caused by toxins but, most of the time, a specific cause of chronic failure remains unidentified. The main concern is management of the condition for the comfort and life quality of the pet, slowing the disease advancement and minimising complications. What is ‘normal’ kidney function? The main functions of the kidneys are to filter out waste products from the blood and remove them along with excess water from the body, in the form of urine. The functional units are called nephrons, which are tube-like structures. The waste products are left over once food has been digested and are also produced by active muscles. Waste products, or toxins, have detrimental effects if they accumulate and remain in the body. Kidneys are also important for the stimulation of red blood cell production by bone marrow, as they produce the hormone called erythropoietin. The kidneys have a great capacity to compensate for loss of nephrons, and it isn't until around 70% of the nephrons have been damaged that symptoms are recognised. How can you help support a cat with renal failure? As mentioned before, waste products originate primarily from food and unusable or surplus amounts are harmful to the body, producing a wide variety of symptoms. If diet is controlled and tailored to the condition, the symptoms and rate of advancement of the disease can be reduced. 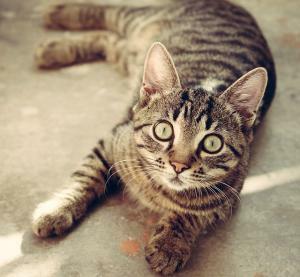 There are four main areas to consider when feeding a pet with decreased renal function. Water intake - pets with CRF are prone to dehydration. Damaged kidneys lose the ability to conserve water and instead of being reabsorbed back into the blood, it is lost via urine. Pets will produce a larger volume of dilute urine and will need to go the the toilet a lot more often. A fresh water supply is vital to allow the pet to replace lost fluids and additional bowls should be placed around the home. Protein content - amino acids, the building blocks of proteins, are a vital part of an animal's diet for energy, growth, maintenance of muscle, skin and coat and other functions. High quality protein sources ensure that correct levels of essential amino acids are met, while leaving fewer waste products behind. Your pet may find a renal diet less palatable than their regular food but you should encourage them to eat it and swap the food over slowly to avoid a sudden change they may reject. Phosphorous/phosphate content - build up of phosphorous in the blood is directly linked to advancement of kidney damage and decreased life expectancy in cases of CRF. High phosphorus levels cause a variety of unpleasant symptoms such as secondary hyperparathyroidism. Limited intake is extremely important. Omega 3 and omega 6 fatty acids - increased levels of omega fatty acids help to slow down progression of kidney disease by maintaining the glomerular filtration rate and reducing inflammation. An increased filtration rate owed to increased blood pressure in advanced kidney failure exacerbates damage and leads to loss of protein in the urine. As an owner, the key points to focus on are keeping your pet hydrated and to encourage a healthy appetite. Renal diets are key to disease management and have been designed to be as tasty as possible while reducing the ingredients that your pet's kidneys can no longer tolerate. Supplements can also help enormously by containing phosphate binders that prevent the absorption of excess phophates in the intestine so that they never reach the bloodstream. They also replace potassium in the body, which is essential for many internal processes. If you have any advice, please share it with our other readers! Thanks for the info. on renal function,I do hope this does not happen to my cats, forewarned is best. I was a dog person 40years and I am just beginning to learn about cats. Very helpful. We had a cat for 18 years and was diagnosed with kidney disease at 14. On the renal wet food diet (and no other food) he was very happy and content and you would have never have known he had it. Our cat, The General, was diagnosed with CRF 5 years ago at just 4 years old, and was given 6 months to live as her blood figures were so bad. She is still with us today. The hardest thing is encouraging her to eat. We have to keep changing her renal food and sometimes mix it with the gravy of non-renal food. We feed her little and often and she also has a water fountain. She is also on Benazecare and Semintra. She costs us a fortune each month, but she is worth it. She is our little miracle! We were very fortunate to discover our cat had very early stage CKD due to needing a broken tooth removed. Initially we were told to put him on a few renal packets a week - which he would not eat. Another vet after further urine?blood tests advised a phosphate binder. That was 3+half years ago. He is still healthy (a bit arthritis at 15+half) and a very healthy appetite. So thankful he broke that tooth otherwise we wouldn't have caught the disease so early.